The Prince of Egypt – 1998 | We Can't Hear the Mime! 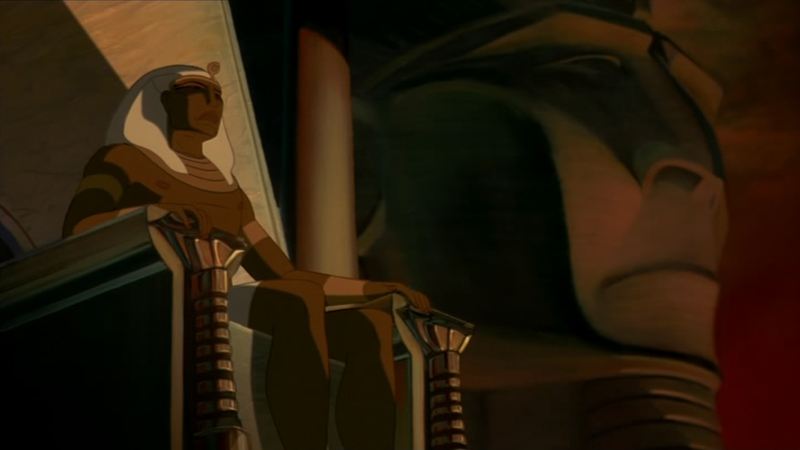 Today I had the rare luxury of re-watching a childhood favourite due to an unindentified malaise which has left me sofa-bound – Dreamworks classic “The Prince of Egypt.” I want to explain why I find this film to be such an achievement of cinema. I suppose, by this point, even a casual observer of this blog will have come across my passion for animation. Surprisingly, however, I find this film equally interesting for the fact that it is animated as for the fact that it is viewed as a “children’s film”. I say this advisedly since I do not believe there should be such a strong division between entertainment for children and adults. But that’s a whole other topic. What is fascinating about children’s cinema, when done well, is that it can communicate difficult ideas to a child, while still having the emotional impact for an adult audience. As an example let’s take Mufasa’s death in “The Lion King”. Death is undeniably traumatic and not, by modern standards, “child friendly” viewing. Yet “The Lion King” effectively communicates this difficult concept. In fact, the sequence shows us the cub Simba understanding and processing his father’s death before Scar confirms it in words. In other words, a Disney film can communicate the shock and sadness of death to anyone, of any age or nationality, since the sequence is almost wordless. This is an art lost to modern conventional filmmaking, which often relies too heavily on a script and fears silence. It has reason to fear; when no one is speaking the visuals must stand alone and all too often they are not strong enough to do so. Silent cinema never had this problem. Buster Keaton’s films are still funny whatever language you are in. You can appreciate the bumbling inefficacy of the keystone cops even without intertitles. Without a script films had to be demonstrably funny or tragic on visuals alone. This is why these days, it is far more common to find true, global cinema in animated films. Films where, by their very nature, the visuals are strong because every single frame has been hand crafted to perfection over a period of weeks. Returning to “The Prince of Egypt”. My admiration for this film results largely from the animating style. The film bridges a gap in the animation timeline and represents a merging of hand painted backgrounds, hand drawn line animation and computer generated special effects. The result is, that despite the huge number of special effects shots, the film retains the organic feel of earlier, line drawn, hand-painted animated features. This visual depth is positively enthralling. All that can be done by hand has been done, and so the computer images do not invade upon the visuals, but are more like the icing on the cake than anything else. The artistic style is shockingly different from that of, for example, contemporaneous Disney films. While Disney was relying on cultural stereotypes and caricatures to make Mulan (made in the same year), The Prince of Egypt portrays accurately and sensitively three different ethnic groups. While a lot of this is represented through location and costume design choices it is undeniable that all three of Egyptians, Hebrews and the Midian people are shown fairly and without generalization. These cultural details leak into the narrative, the Egyptian handmaidens trying to take the baby moses as their own, the traditional Midian dress style, even Moses’ hair colour. Moses is the only one among the Egyptians shown to have brown eyebrows, displaying his identity as an outsider, even as he is revered as their Prince. 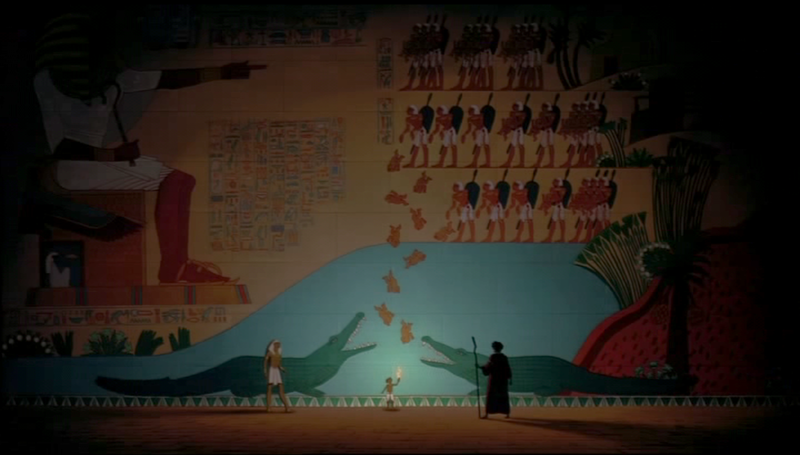 Also, I would like to call attention to the masterly use of traditional Egyptian art as a dream sequence. Traditional art and culture played a huge part in the production of this film. Biblical and historical scholars were called in to ensure the film was accurate to all narrations of the Moses story. That is not to say that the director (Brenda Chapman) strayed away from any bold decisions. Quite the opposite, the voice of God in The Prince of Egypt is provided by Val Kilmer, the same voice as Moses. The subtle implication being that every man would hear God’s voice as their own. In some interpretations of the Bible that decision alone marks this film as heresy. This opens the film out to not just being a religious film. The Prince of Egypt adapts a Biblical story and, while it pays its dues to the version held dear by each Abrahamic religion, it does not alienate an audience who believes in one or none of these religions. Despite the religious themes even the most famous song “When you Believe” (Schwartz’s great Oscar winner) is at best an ambiguous exhortation of confidence and perseverance. Another brave decision is to present Rameses sympathetically. While he is clearly the antagonist, the film clearly steers away from making him the villain. This is of course this is helped enormously by Ralph Fiennes vocal performance. He is hot-tempered, yes, blinded by his hoodwinking priests, yes, but he is not evil as so many people are in children’s films. In fact, he is shown to truly care about Moses. It is only when he is totally rejected by his long-lost brother that he turns against Moses and his mission. The sorrow in Rameses voice even until the very end, shows us the pain of a man rejected by his father, then abandoned by his brother, who finally forms a family only to have his son stolen from him. Visually he is even assigned the colour blue, his headdress, horses bridle’s and jewellery are consistently sapphire, a colour with connotations of weakness and fragility as opposed to Moses’ robust red. Returning to my earlier point about communication, this is one of the ways in which The Prince of Egypt transcends the barriers of comprehension. By showing Rameses in blue, and portraying him in despair as often as in anger it is impossible to come away from the narrative with an impression of evil or villainy. Both Rameses and Moses are true Aristotelian tragic heroes. Neither is guilteless in their fight, Moses even stoops so low as to send the plague upon the first borns – the very act which so disgusted him earlier in the film. It is a fantastic vote of confidence in the audience for the director to allow such contradictory portrayals to exist within a “children’s film”. Chapman does not simplify or remove the difficult aspects of the story for the sake of the childish audience but guides them to make their own conclusions from the subtle characterization. This trust in the audience is so strong that years of character development and a death can be explained in a single shot of Rameses standing where his father stood, dwarfed by the twin statues of himself and his father. The musical score adds to this communication more than words could in places, Schwartz gives us a score coloured by traditional instruments, gospel style musical patterning, and an emotional thrust unlike any other. The Hebrew interlude in “When you Believe” is almost a direct quote from the Hebrew bible and the framing of the film in the same musical motif in both “When you Believe” and “Deliver Us” lends weight to the narrative conclusion and makes the story a more coherent whole. There are few films which achieve brilliance in visuals, soundtrack or storytelling. When I come across one which delivers on all three, I cannot write it off because it’s an animated children’s film. Any piece of filmmaking which can communicate in such a concise way on such a fundamental level is a film which brings humanity out of the gutter. . It is our ability to create art, and with it define emotion, which sets us apart from animals. This entry was posted in Film Reviews, Personal Screen, Screen 8 and tagged Animation, Brenda Chapman, Children's films, Disney, dreamworks, Film Review, Moses, Ralph Fiennes, Steven Schwartz, The Prince of Egypt, Val Kilmer on August 31, 2013 by Flo. I remember watching this as a kid and being amazed by the beautiful animation. Reblogged this on Floliketheriver – Blog..